The Consiglio Generale was a section of Sienese government that remained in place even during the constant power shifts that occurred during Catherine’s lifetime. They had the power to veto and pass acts set forth by those in power. 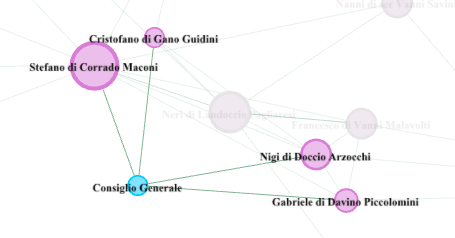 Catherine had a few connections to this governmental body, including, Stefano di Corrado Maconi, Cristofano di Gano Guidini, Nigi di Doccio Arzocchi, and Gabriele di Davino Piccolomini.